This entry was posted in Home-Post on March 9, 2015 by admin. This entry was posted in Home-Post on February 23, 2015 by admin. Smart Start Academy has chosen a curriculum based on educational research. Your child will have the early literacy skills needed to become accomplished readers and writers.The Open Court Reading program, also used in the public kindergarten, provides instruction in all areas of a balanced literacy program: speaking, listening, reading, writing, thinking, and viewing.The program features systematic, explicit instruction in phonemic awareness, phonics, and comprehension word knowledge, along with extensive reading of decodable text and fine literature. This entry was posted in Home-Post, Programs on February 23, 2015 by admin. This is the preliminary curriculum to the full Open Court Reading program that is used in the Toms River School System. Your child will be prepared and ready to learn upon entering their kindergarten classroom. Smart Start Academy welcomes you to the pre-school years. Our program is designed to boost your child’s fascinations and enrich their skills. This is where your child’s formal learning years begin. We realize that for many children this is their first opportunity to experience interaction with a large group of children on a day-to-day basis. 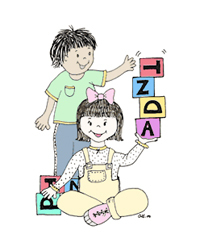 We, therefore, place a large emphasis on socialization and sharing techniques, as well as on educational areas such as vocabulary, language, large motor skills, and fine motor skills. We begin to focus on shape and color recognition, in addition to the exposure of letters and numbers. Our staff is trained to encourage your child through the journey of exploration.